A majority of the users expressed that the Nike Manoa offers a rather comfortable feeling on the foot. A good number of users of the shoe commented that it feels lightweight. The shoe is easy to clean, according to a handful of Nike ACG Manoa reviews. Several of the users claimed that the shoe provides a good ground grip. A decent number of buyers loved the design of the shoe, saying that it looked ruggedly stylish. Many reviewers were appreciative of the durability of the shoe. One reviewer said that the Nike Manoa is an awesome multi-purpose shoe. The shoe provides adequate support, according to some of the users. The shoe is definitely recommended as what a lot of reviewers said. One can purchase the shoe at a budget-friendly price. A buyer can choose among a variety of colorways offered for the shoe. The Nike Manoa may run a bit narrow, according to some of the users. One reviewer complained about having snow getting stuck on the sole of the shoe and would leave a puddle beneath when standing on a spot for a long time. From the Nike ACG line, the Nike Manoa was designed to provide comfort and protection for different kinds of elements and makes it suitable for the cold weather. A lug-patterned tread on a trail-inspired rubber outsole is built on the shoe which provides a rather sufficient traction on different kinds of ground surfaces. The shoe also offers a lightweight feeling for the foot with its full-length Phylon midsole. Along with its versatility in style and a rather wallet-friendly price, one can make a great purchase with the Nike Manoa. Looking back on the history of Nike, the brand actually stemmed from the creation of another brand back in 1964, its older brother known as Blue Ribbon Sports (BRS). This company was founded by Phil Knight and Bill Bowerman who joined together to take on the footwear market head-on. At first, BRS was a simple company, content to with being distributors for Onitsuka Tiger in the USA but somewhere down the line, Phil and Bill began to crave for something more. BRS broke off its ties with Onitsuka Tiger and decided that the next best thing for them to do was to create their own line of sneakers. They had a factory in Japan manufacturing their sneaker line and with it, decided to go for a name change, ultimately coming up with Nike. The company was taken to new levels of success, and this success paved the way for Nike to open up other subsidiary lines under it. It was in 1989 that the Nike ACG (All Conditions Gear) debuted. The apparel garments included in the line were all named after mountains such as the Cerro Torre, Makalu, Kilimanjaro, etc. The Nike Air Pegasus was the first ACG shoe released. With that, the Nike ACG line soon garnered a massive following amongst sneakerheads as well as adventure enthusiasts. One reason for that is because of the bold designs of the footwear, and the bold colorways, colorways that created a unique array of Nike ACG collection. Throughout time, the Nike ACG line has produced high-performance footwear that meets the needs of the wearers. Along these products is the Nike Manoa. The silhouette showcases a classic, rugged, workboot look which also flaunts a sleek look that is great for the city sidewalk strolling. A waterproof leather covers the upper of the shoe with the deep lug-patterned tread on the outsole as a finish. When it comes to style, the Nike Manoa represents versatility. Though the shoe is originally designed to have the ability to go through rough terrains and survive the heavy-duty use, one can still flaunt these pair of kicks for the fashion purposes especially during the fall and winter season. The high-top Nike Manoa can be a perfect choice if one opts for a more casual look. It can also be an essential cold-season kick that serves well as a finish for a rather rugged street-style appeal. With an appropriate set of top, the Nike Manoa goes well with a pair of regular cut jeans, fitted jeans, and cuffed jeans. The boots come in several different colorways with Nike having added more and more colorway variations to the mix to get people buying. With the right style and pairing, the Manoas sure do become a delight to wear, especially if you color coordinate them properly. Some of the more popular choices with the Manoa in several colors include the Nike Manoa boots in black or grey or the Nike Manoa in fauna brown, as well as the ever-popular haystack or honey colored ones. With the traditional lace-up closure system of the Nike ACG Manoa boots, a wearer is allowed to lock down their foot in a comfortable and favorable fit. The webbing heel pull loop also offers ease when putting on and taking off the shoe. Before wearing it, the boot itself could look a little bit constricting but when worn, it’s pretty comfy with a plush lining inside to make things better. The Nike ACG Manoa is offered in men’s sizing which ranges from size 6 to size 15. Half sizes are also available for the shoe. Women can also get a pair of this shoe by subtracting 1.5 from their usual sizing to fully accommodate their own foot size. These kicks are offered in medium width though some may find it a bit narrow and may not be favorable to those who do not have the standard foot width. The shoe also fairly runs true to size. What most buyers were really on about the Nike Manoa boots is how comfortable it is for the foot. A lot of these wearers gushed about how this pair provides the needed all-day comfort for their feet. They were highly-appreciative of how the shoe keeps their foot from hurting after a long day on their feet from either a heavy-duty work or from walking around. There were also many who gave quite some recognition on the design of the shoe, saying it looked really stylish and can be great for some casual use. Being part of the Nike ACG line, the shoes become impressive in its own way since the reputation of this line, and the designs that it has released are highly sought after. 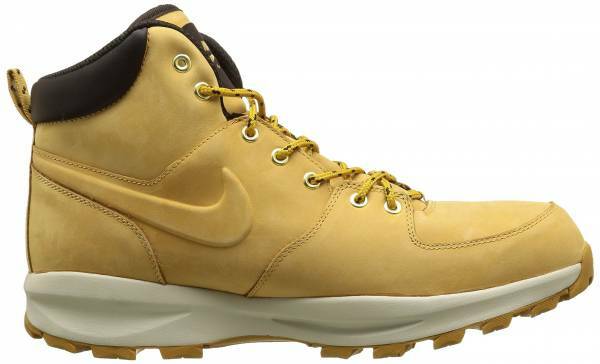 The circumference of the Nike ACG Manoa boot approximately measures 13 1/2” while the shaft approximately measures 4 3/4”. Measurements are based on men’s size 11 with D width. The shoe is built with a gusseted tongue which prevents debris from getting in the shoe. A VAC-TECH “Swoosh” design trademark can be observed in the shoe. A padded footbed and a breathable mesh lining were also built on the shoe which provides all-day comfort. Flex-grooves can be observed along the length and width of the outsole of the shoe which provides improved flexibility that allows a smooth and efficient ride. The toe bumper of the shoe provides comfort and protection for the foot.